I have been dreaming about this kind of house for a very long time. After the carriage house in Tbolt was complete, I knew I would always and forever need LOFTY ceilings with lots of light. My new project on Isle of Hope will offer that lofty feel but with a Lowcountry twist. 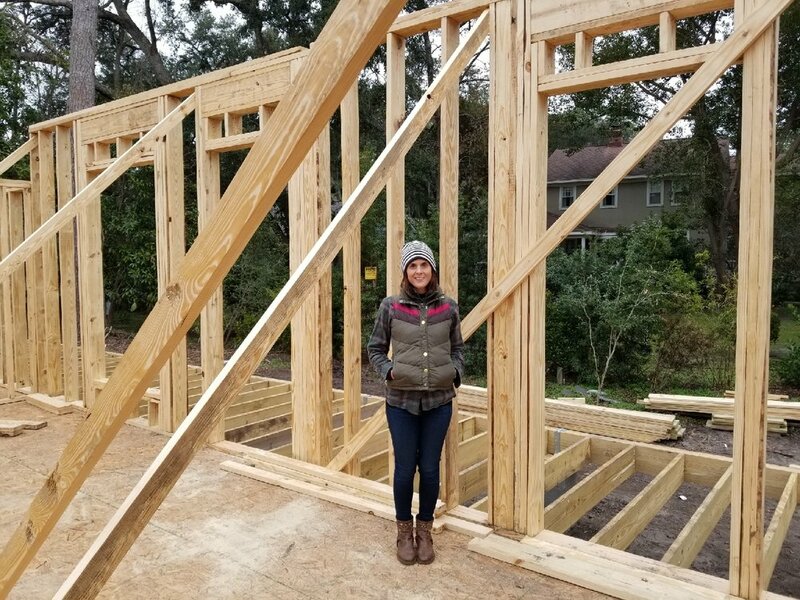 Here are some quick photos of the house going up… Some of my favorite features include the wraparound porches, mudroom, pantry, big party shower, and flexible living spaces. Onward we go! After a couple weeks of planning and slowing down due to the holidays we are back on track! Last weekend Duke’s Dad and I got the doors from Pembroke (pronounced “brook,” not “BROKE”), I finished cleaning out the drywall, and he ripped up subfloor in the kitchen so the tile would be the same height in the kitchen as newly found hardwoods in living room. The physicality of the work is A LOT! I feel like I have some minor nerve damage from 3-4 hours of pulling nails — what a weenie! That and the DENIM-looking tile is down in the kitchen! I closed on another renovation project with my neighbor December 31st (we start bidding next week) and had a disappointment with the small house community I’ve been wanting to build (CHIN UP!) so I was not at the work site as much as I wanted to be this week but did get to shop vac and clean up the site some (I love a sparkling clean site!). More Parkside inspiration for Ze Pancake! When Duke’s Dad and I sat down at Larry’s to grab some breakfast yesterday (my way of bribing him to help me pick up my new doors w his trailer!) I picked up my pen and just started scribbling on my placemat. I suppose it helped me translate what he was saying about options for affordable metal siding (ala Austin, TX) and getting creative with textures and materials….. Artist or not, if you have ideas, just try and get ‘em down on paper somehow. I noticed my scribbles end up having more in common the more and more I scratch them out. Those patterns help reiterate what I want to see aesthetically and helps me develop my plan. The Mustard Pancake - a Renovation! Oh boy! My arms are already sore and its only been two days of slinging a hammer. Yes, I am a pipsqueak BUT I do like my demo time. It’s kinda like winter, a time to strip down the layers and get to the meat of what’s ailing you in order to build back. Oh, so deep, meaningful, and (slightly?) annoying, but TRUE! The Mustard Pancake is ready for a full on FACELIFT, but we are not going to stop there! We are gonna give this ole’ gal the full on WORKS. We’re talking inner-workings, plugs for the hair, an eye-lift, skinlift, and permanant eyeliner and lipstick! Meaning, you will not recognize this 1938 Doll in a couple months. The Mustard Pancake! She has absolutely NO facial features but we’re going to change that! So far, I’ve been pleasantly surprised to discover that we indeed DO have hardwoods under layers on linoleum. I was FOOLED to thinking it was gone somehow. Everything else is just garbage done poorly and cheaply. The windows are awful and the crawlspace has been covered up giving way to 40% humidity underneath the bathroom (note to self: never hire the handyman for this house who created a termite highway of EARTH TO WOOD DIRECT CONTACT!!!). FEAR NOT, I have a plan! I have been inspired by JH Interior Design for some time - mainly the small home she renovated for her family. The loft in her farmhouse inspired my new house design at Thunderbolt & Isle of Hope and the big front porch is what pushed me to realize that the Mustard Pancake could actually shine by adding a bit of farmhouse flare and some depth to the front facade (i.e. add a deep porch that wraps around!). Day 1 - we got flooring up and stacked and Day 2 demo began on bathroom. Day 2 was quite hysterical when I thought I’d cut the water off the the refrigerator and low and behold, it was NOT CUT off and I had to repeatedly run buckets of water outside while my friend, TT, came over to cut the water to the house w an oversized wrench. OMG - water everywhere! What do we have here? 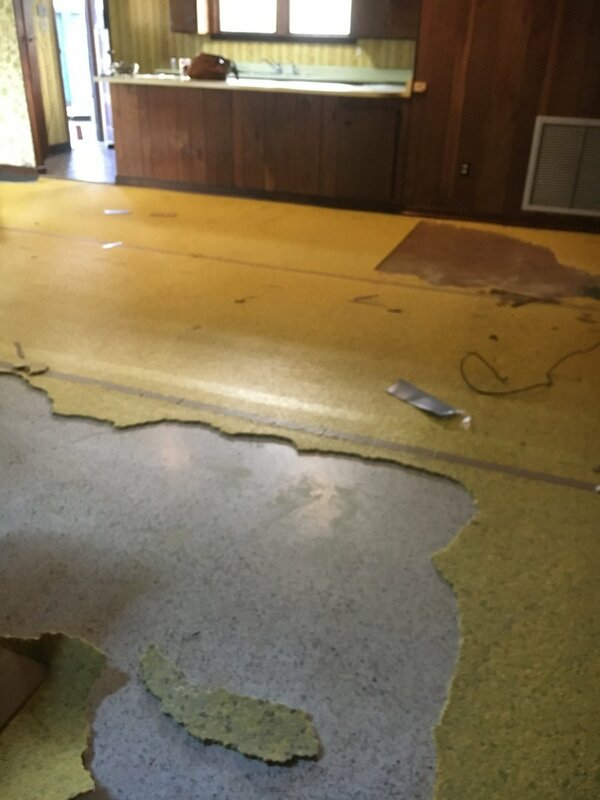 Linoleum and more linoleum. Will give you an update on how my heat gun, utility knife, and scrapers work out for me here in an upcoming post. Thank goodness for the buckets! A good lesson in why its important to always carrying a big ole’ wrench with you! Behold: Yes, I will find a recessed medicine cabinet for this bathroom right after I finish demo-ing this gross vinyl flooring and eliminate these cheap aluminum windows! Long days ahead but hearing the horses whinny and neigh across the street is already worth it! Not to mention the trails with views like this!!! Views on the marsh trail near my new project Tondee has found wonderful things on the trail including friends to romp with and things to ROLL IN! More updates to come! I’ll be posting more images on Facebook soon! Cheers!